Actually, come to Winterfest even if you don’t want to learn tablet weaving, it’ll be fun! Westmead side of the park, off Railway parade. See History come alive in the School Holidays! Watch the combat, cheer for your favourite knights, have a go at “Orc” hunting at the archery range, and come along and learn from the best about history and enjoy the other traditional activities such as celtic and medieval dancing, food & drink and the Arts & Crafts fair. Prizes and bonuses for best medieval costume, so come in your best medieval dress, and enjoy the fun of the Sydney Winterfest Medieval Fair!! Traditional Archery (open for all), Sword & sport displays, Craft Markets & Stalls, Kids Games & activities, the Full Flight Birds of Prey Display and featuring the Knights of NOVA HOLLANDIA, where you can experience the breath-taking Tournament Joust, and meet history head to head! 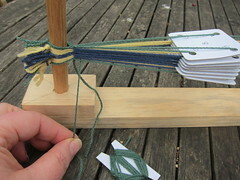 I’ve been meaning to put together a tablet weaving tutorial for some time now. I know there’s a multitude of them already out there on the web both in video and plain old text and pictures form, but this Muddle of mine just didn’t feel complete without my own version tucked into place. What I’m aiming for is to provide something that is both a beginner’s guide to tablet weaving and also gives all the info you need to do the more complex weaves. It will always be a work in progress as I will continue to add tips and patterns and links to resources as I come across them. I also hope that anyone who uses my instructions will tell me whether or not they work! I have a horrible suspicion that they might only make perfect sense to me because I already know what I’m talking about. Anyway, it’s all linked up there in the main menu under Tablet Weaving so have a look around and let me know what you think. My other reason for developing the tutorial is that I plan to begin running tablet weaving workshops at public reenactment events. The first of which will be this weekend at Winterfest. Adam has made a whole bunch of little teaching looms for me and I will be making up kits of wool, pattern and cardboard tablets with which to teach anyone who hangs around looking interested for long enough. I wish you could come!